By the time someone in your boat says something like “I guess the big girls aren’t hungry anymore,” it’s likely already too late – the big female walleyes you’ve been catching (or someone at the bait shop bragged he’s been boating) are long gone, having retreated briefly to recuperate and feed out deep. Yes, they’re still eating – just from a different menu, at a different diner. To boat those big girls, move from the spawning flats where all you’re catching are small males to nearby offshore “summer” structure. If the water’s warm, bomb ‘em with Rapala Rippin’ Rap®s. But if the water’s unseasonably cool, try slowly trolling No.12 Rapala Down Deep Husky Jerk®s. The latter tactic is how In-Depth Outdoors TV Host James Holst and Door County, Wisc. guide Paul Delaney caught ‘em on Green Bay the last week of April, filming a show that aired Sunday on the Fox Sports North channel. Watch the show on YouTube here. A No.12 Down Deep Husky Jerk measures 4 ¾ inches. Owing to its oversized, deep-diving lip, it can reach as deep as 20 feet when trolled, running straight and true all the while. Holst and Delaney are trolling their Deep Down Husky Jerks with planer boards on rods with line-counter reels. Bites are coming with 60 to 80 feet of line out. Water temps are in the mid-40s, skies are blue and there’s little to no wind – not exactly classic walleye-catching conditions. They started the day pitching jig-and-plastic combos shallow, but have moved offshore. 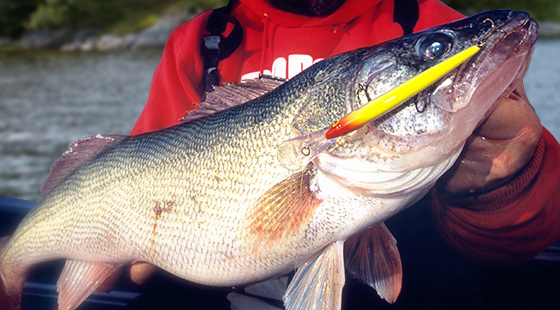 Delaney’s first deep-water walleye comes on Down Deep Husky Jerk in the Pink Clown pattern. Holst’s first offshore hook-up comes on the same bait in the Helsinki Ghost pattern. Holst and Delaney’s deep-water Husky Jerk success illustrates what fisheries biologists will tell you too. Large female walleyes travel in the spring with smaller males to shallow shoals and flats to spawn. The best areas have a rocky bottom with thousands of nooks and crannies to conceal the walleye’s fertilized eggs from predators. But once nature has taken its course, the females don’t hang around the males for much “pillow talk,” so to speak. They retreat deep. Cameras rolling, Holst and Delaney continue to make their case, doubling up again. Down Deep Husky Jerks come in 24 color patterns to cover any situation an angler faces. In addition to their forage-mimicking visual appeal, these deep-running plugs feature tuned, internal rattle chambers to add loud, rhythmic attraction. Their premium VMC black-nickel hooks keep even bigguns buttoned on. Indeed, most of the walleyes Holst and Delaney catch trolling Deep Down Husky Jerks in Sunday’s show are hooked solidly enough the anglers don’t need a net to boat them – both an indication of VMC hook quality and validation of the duo’s declarations that big walleyes don’t stop eating after they spawn. Most walleye anglers have likely heard sob stories about the dreaded “post-spawn lull,” Holst says. “Fish are ‘supposed to’ go into a funk” and not feed, he says, summarizing the so-called conventional wisdom. But a big female Delaney has just caught and released flies in the face of such dock talk – signs in the walleye’s mouth indicate it had been caught at least once previously. And recently. “There’s a freshly spawned-out female that’s been caught twice, once by us, one other time by somebody previous,” Holsts says, netting and releasing the fish for Delaney. Misconceptions of a “post-spawn lull” come from anglers who try – and fail – to catch big post-spawn walleyes where they caught them pre-spawn. But the big females retreat to deeper structure shortly after spawning, leaving the males behind. Fishing authorities with scientific credentials say walleyes function metabolically more effectively in deeper water. After a post-spawn stint offshore, however, big female walleyes will return shallow to feed until summer temps heat up and push them deeper again. With water temps in the mid-40s the morning they launched the boat to film Sunday’ show – following a night when air temps fell to 24 degrees – Holst and Delaney suspected their go-to Green Bay early-spring Rippin’ Rap program would not work with as much success as it has in the past. “When you’ve got the combination of really calm winds and very cold overnight temperatures, that Rippin’ Rap® bite can be a little tough,” Holst explains. So they began this day casting ¼-inch VMC® Neon Moon Eye Jigs dressed with chartreuse soft-plastic, curly-tail ribbed worms and minnow-shape baits. They caught walleyes, but they had to fish very slowly, bites were very light and they didn’t catch any big ones. That’s why Holst calls the audible to head out to deeper structure and troll Down Deep Husky Jerks. As dusk nears on this filming day, Delaney hooks into a hard-pulling walleye he says will likely “be the one we’ve been looking for.” He takes his time reeling it in. His patience is rewarded with a nearly 30-inch, post-spawn female. She’s a Green Bay beauty. Holst, a Minneapolis-area resident, asks Delaney, a Door County local, how long big post-spawn walleyes will feed in deeper, offshore haunts like they one they’re catching ‘em on. Want to fish Green Bay walleyes with Delaney? Reach him online through lateeyessportfishing.com. Learn more of Holst’s fish-catching tips every Sunday on Fox Sports North at 8 a.m. CST or anytime on the In-Depth Outdoors TV YouTube channel. Good solid info. However, failed to see what the slow trolling speed was. Would think that noting the trolling speed is an important part of the puzzle.